Immigration policy has catapulted to the forefront of public debate around the world as governments from Europe to America to Asia become increasingly restrictive and hostile to migrant and refugee flows. While deportation, detention, and border-control policies are by no means new, there has been a clear surge in emphasis on these policies. 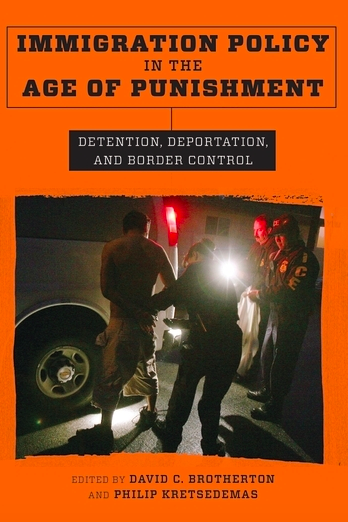 In their chapter for the 2018 volume Immigration Policy in the Age of Punishment: Detention, Deportation, and Border Control (edited by David C. Brotherton and Philip Kretsedemas), the GDP’s Executive Director Michael Flynn and Contributing Researcher Matthew Flynn examine factors that have spurred the global rise of immigration detention. In contrast to post-structural arguments that view the rise of immigration detention as a symbolic act of national sovereignty aimed at demarcating those within the nation-state by excluding others, Flynn and Flynn advance an actor-oriented analysis that views detention systems as complex organisations that rely on institutional and legal structures to buttress their existence, multiple sources of financing to grow operations, and support from a broad range of social actors who have both diverging and overlapping motives for promoting expansion of this tool of social control. More information about Immigration Policy in the Age of Punishment: Detention, Deportation, and Border Control is available here. Selected sections of the book are available on Google Books here.